After last week’s call out for Canberra’s best fresh produce I did some research to find out which fruit and vegetables are currently in season in the Canberra region. Citrus is particularly big right now with lemons, oranges and mandarins at their best. On the vegetable side of things, cauliflower, cabbage, carrots, English spinach, potatoes and pumpkins are all in season. In the call out, nominations came in for a number of markets and greengrocers around town, including the Southside Farmers Market in Phillip, the Fyshwick Fresh Food Markets, Jabal Halal in Mawson and Freddy Frapples at Cooleman Court. However, there were two very obvious frontrunners – the Capital Region Farmers Market and Choku Bai Jo. To help me compare the top two, I enlisted the help of my partner, Matt, and wrote a small shopping list of some of our favourite fruit and veg that are in season at the moment – mandarins, cauliflower and English spinach. First stop was the Capital Region Farmers Market, which is held every Saturday morning from 7.30am to 11.30am at Exhibition Park in Canberra (EPIC). With more than 100 stallholders each week, it is Canberra’s biggest farmers market. 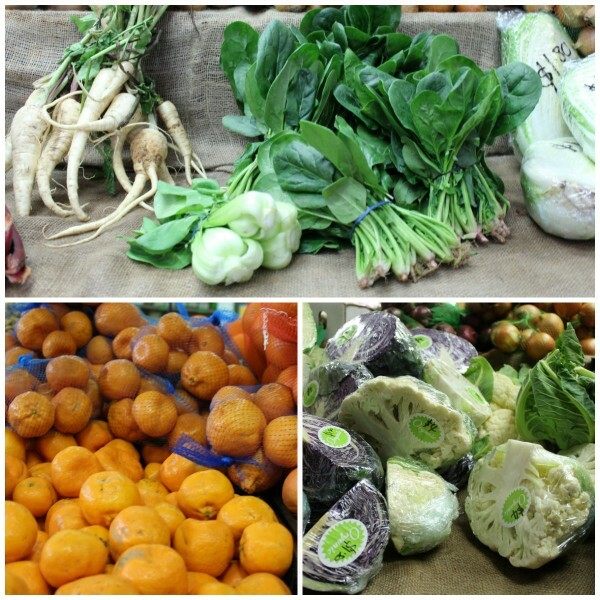 We wandered around and had a quick look at all the stalls before buying the few items on our shopping list – imperial mandarins ($3.50/kg), cauliflower ($4.50 each) and English spinach ($2.00 a bunch). One of the best things about farmers markets is buying straight from the producers and being able to have a chat and learn a thing or two about their produce. More importantly, you also know that what you are buying is fresh and in season. Next up, we went and did a little fresh food shopping at Choku Bai Jo at the Curtin shops. For those of you who live on the northside, it also has a shopfront at the North Lyneham shops. Originally set up as an extension of Canberra’s farmers markets, it isn’t surprising that Choku Bai Jo sells produce from many of the same producers you can find at EPIC on a Saturday morning. Choku Bai Jo is slightly more expensive than the farmers market, and (perhaps not surprisingly!) there is less to choose from. We stuck to the same shopping list and got some imperial mandarins ($4.20/kg), cauliflower ($4 for half, $8 for whole) and English spinach ($2.80 a bunch). Despite the higher prices, there’s a lot to love about this little greengrocer. I like that they label all produce with the name of the producers, where it came from and the distance in kms from Canberra. The best part, however, is that they are open six days a week. So if you happen to miss the farmers markets on the weekend (because it’s July in Canberra and still -3 degrees celsius mid-morning) but want to buy great fresh local produce, Choku Bai Jo is here to save the day. Deciding between the Capital Region Farmers Market and Choku Bai Jo really came down to a few minor details. 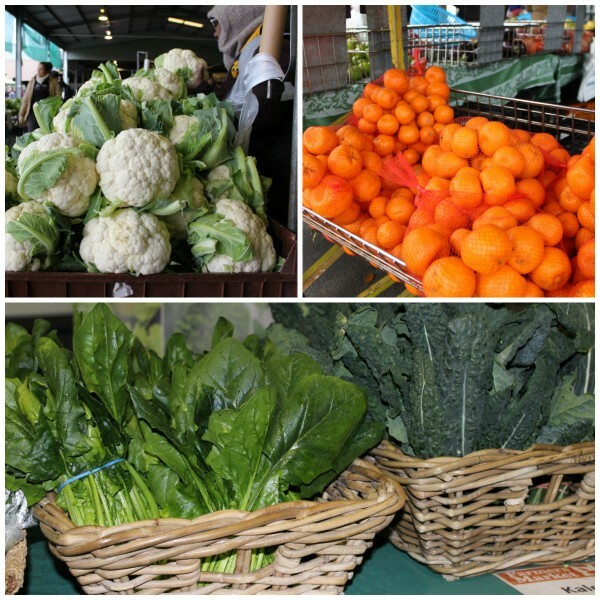 On the freshness front, they are pretty equal as they both sell fruit and veg often from the same local producers. Choku Bai Jo is good because you can shop there six days a week, but the Capital Region Farmers Market has a much larger selection and cheaper prices. This week, the Capital Region Farmers Market takes out the crown for Canberra’s best fresh produce. I’m still yet to find a stall holder at EPIC selling Ginger… ? Oh and although difficult, you can grow Ginger in the cold Canberra climate. Just keep it potted and indoor during winter. The Saturday market is great, if you get there before the crowds. But there seems to be a few stalls there fudging the system. Like pepmeup are they really growing that ginger. Most of the smallholders I like and trust also supply Choku so that’s where I go when I sleep in, so usually. I’ll always be a fan of EPIC markets, but it’s great to know there’s somewhere to go when I sleep in on both days of the weekend…now I can legitimately get away with it and still avoid Woolies and Coles! We are very excited to be named in the RIOTACT’s ‘Canberra’s best fresh produce’ survey/write up. We would like to thank the people who voted for us and The RIOTACT for highlighting fresh local produce in the Canberra region. We would like to clarify that the price listed for our cauliflower is for certified organic cauliflower. The Choku Bai Jo Team.